The Health Sciences Library and The University of Alabama provide a number of resources to help you with writing, research, and references. 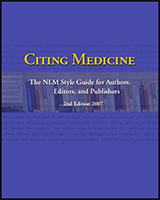 EndNote is citation management software that allows users to create customized libraries of references, automatically create citations and bibliography matching the requirements of the selected journal or style manual, sync and share references, and more. In addition to installing EndNote on personal or University machines, users can also access EndNote anywhere using EndNote online. RefWorks is a web-based tool available for all University of Alabama students, faculty, staff, and alumni to use. Save citations, organize and share your research, and create bibliographies! Zotero is the only research tool that automatically senses content in your web browser, allowing you to add it to your personal library with a single click. Zotero collects all your research in a single, searchable interface. You can add PDFs, images, audio and video files, snapshots of web pages, and really anything else. Zotero automatically indexes the full-text content of your library, enabling you to find exactly what you're looking for with just a few keystrokes. The Online Writing Lab (OWL) at Purdue University houses writing resources and instructional material. Users worldwide will find information to assist with many writing projects. Teachers and trainers may use this material for in-class and out-of-class instruction.